Here’s our interview with Cliff Stamp. Make sure to check his website and his youtube channel. 1. 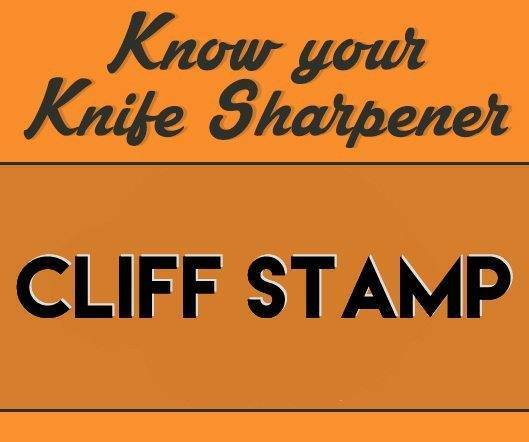 Hello Cliff, Can you tell us a bit about yourself, and how you started sharpening knives? My grandfather showed me the basics when I was very young, ~ 5 . 2. Can you tell us more about the sharpening technique that you use today? This sharpening wastes no metal in sharpening, and produces the strongest edge. 3. Do you strop your knives on leather or another medium upon completion of your sharpening process and if so, why? No, it would not do anything productive. The knife is sharpened on the stone so stropping could only degrade the sharpness. 4. How do you test your knives for sharpness? I measure it by push cutting fine thread and measuring the force, and slicing fine thread under a given tension and measure the distance of cut. 5. What do you think is the most important Water Stone in your line up? All stones work well on certain steels under certain pressures. My most common heavy grinding stone now is a Suehiro ‘Chemical‘ 320 because it works well under low to moderate pressure (< 5 psi) on easy to grind steels . On harder to grind steels (10V) it needs more pressure (10 to 15 psi) and it tends to smooth out in use and have to be conditioned. For those steels I would use a Sigma Power II which has a lower bond strength and will cut them and stay aggressive at low pressure (< 5 psi). 6. How do you flatten your water stones and how often do you do this? All of the stones including Norton’s are flattened on other stones, this keeps everything flat. They are flattened as soon as they show any visible deflection, and they are conditioned when they go slick. How long this takes depends on the steel and pressure. But it is usually between 1000 – 5000 passes. 7. What do you think is the most common mistake beginner knife sharpeners make, and how can they avoid it? The most common problem isn’t really with the user but with the knives. Most production knives and even the small shop blades have very uneven edges. If you are starting to sharpen and the angle on one side of the edge goes from 15 to 20 dps and on the other side ir goes from 20 to 25 dps it will be frustrating.This is where coloring in the edge can help as it will show that you are only grind on part of the edge on one side and maybe another side isn’t even grinding on the edge at all. 8. Most novice sharpeners are very concerned about the sharpening angle. How do you feel about angles and their importance? It is very important to match the sharpening angle to get the cutting ability/durability you want. For sharpening, the more consistent you can hold an angle the faster (and less frustrating) the process will be. If you sharpen with a high angle scatter it will be very difficult to remove a burr and you will likely grind one unintentionally often. Hence in the beginning some kind of jig/clamp might be a good idea. 9. Is it a good idea for a beginner to start sharpening using cheap knives? Would you recommend doing it? In time you might want to not grind a bur and plateau sharpen and experiment with various angles/finishes and passes. But that very simple method can produce a result sharper than 99% of the knives made. 10. Are you still improving your sharpening process?